We all know that violins can survive for hundreds of years. And we are not just talking about Stradivari or Guarneri or Amati instruments. It means that any violin (including yours) can last a lifetime (or more!) if, of course, you take good care of it. Sometimes, we are not taught essential information about our violins, especially about proper violin care. We forget that it needs to be maintained, and sometimes, most of us get too lazy to just even wipe the dust off of the violin. Here are 22 violin care tips from experts and famous violinists to maintain your violin in its optimal playing condition and make it last a lifetime. The first step in caring for a violin is to get a good quality violin case. It should be durable and made with higher performing materials. You should also be able to strap your violin by the neck so that it will remain secure whenever you are traveling or when your violin is in transit. It is also essential to make sure that the case has a lot of padding to avoid getting scratches on the violin. Paddings should cushion the violin, not to the point that it rubs aggressively against the varnish. The white dust on the violin after playing is called rosin dust. Any rosin left on the strings or over the body of your violin can cling to the instrument and cause it to be sticky/dirty. This will ruin the finish of your instrument, and you will eventually have to get it re-varnished if you do not clean it properly. How to clean violin strings and the violin’s body? Use a lint-free, soft cloth to wipe off the rosin dust to clean your violin. Many violin stores sell inexpensive cloth or violin care kit that is ideal for cleaning your violin. 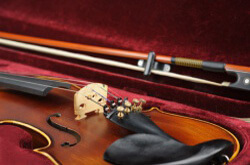 Putting too much rosin on a bow may result in a harsher and scratchier sound since too much friction is created between the bow and the violin string. Although the excess rosin can come off while playing, it might stick to the violin’s body and result to a sticky feel on its surface. This means that there will be more cleaning to do, right? Furthermore, excess rosin may also shorten the lifespan of the bow hair. Re-hairs are expensive, and we don’t want additional expenses. After few days of violin playing, you might be wondering right now how to clean a violin bow. Usually, violin bows are treated with the same varnish as the violin (especially when bought together). This means that you can use the same dry soft cloth in cleaning the violin to wipe the rosin off the wood part of the bow. Never use alcohol or other liquids, or any cleaning solvents to clean your instrument; they can strip your violin’s varnish. Even hot water can hurt your violin. If you are religiously cleaning or taking care of the violin, you do not need to use anything but a soft dry cloth. Some violinists advice the use of wood polish made specifically for violin. This is okay if you have extra money in your pocket, but in doing so, be sure to use a separate cloth than your usual cleaning cloth to polish your instrument. Do you live somewhere below the freezing point? Or in a place with dry climate? If yes, make sure your violin case has features to deal with these extreme temperature levels. And during winter, don’t ever leave your violin outside the house! Always put your violin inside the case when you are not playing. Never leave it on a chair or table or hanging somewhere like your music stand. When your violin is not in its case, it can be easily knocked over, sat on, or stepped upon. Your violin set is made out of organic materials. If the wood dries out too much during low-temperature levels, it can be brittle and have cracks in the wood. Humidifiers like the “Dampit” can prevent extensive drying. Most of the time, high-quality violin cases have built-in humidifiers. It might not be enough just to put your violin in its case; you must also store it properly. Don’t store your case somewhere not safe because your violin can get wet or be tipped over. How to store a violin? Well, the case should be face-up, or on its side. 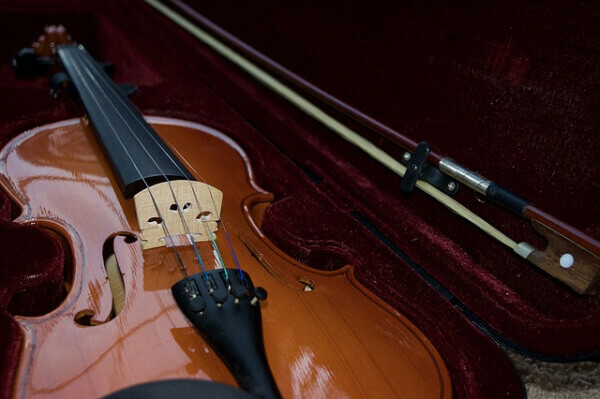 Never put your violin resting on its bridge, even when it’s inside the case; the pressure combined with the high tension of the strings can cause the wood to weaken. Every violin is intended to be played with a set of well-fitted and adequately functioning tuning pegs. Otherwise, you won’t be able to tune the instrument correctly. If your pegs stick, or is hard to tune, apply a bit (not too much!) of a “peg dope” onto the area of the tuning peg that is in contact with the violin hole. This will allow for the pegs to move a bit more freely. Alternatively, if your pegs slip when you try to tune your violin, it’s time for a violin doctor’s check up! You may take your violin to a luthier, and he/she will have your pegs appropriately fitted. The bridge will lean forward if the strings are too tight. To fix it, carefully adjust the bridge and make sure that the bridge’ feet are flat against the surface of the violin. Remember, if the violin bridge falls, the soundpost inside the violin may fall as well. Extra tip: Don’t forget to loosen your strings slightly before you move your bridge. So, how to clean violin strings and keep it appropriately wound? Of course, you need to loosen your violin strings slightly. Then with a soft cloth, you can wipe the excess dust on the string. Also, be sure to wound the strings correctly. Irregularities in the installation/winding, can crack the peg box and should definitely be avoided. Violin fittings include tuning pegs, chinrest, and tailpiece. Using appropriate pegs for your violin help ensure that you will spend less time dealing with peg slippage. When it comes to chinrests, if your chin rest is touching your violin’s tailpiece, it will cause an annoying buzzing noise. If it is too large, it might scratch the violin on the other side. If you have four fine tuners on a wooden tailpiece, it will be very heavy. The adverse effect of this is that it mutes the tone of your violin and alternates its sound. This is the reason why lots of violin players just have one or two fine tuners. Choosing the right tailpiece makes a big difference in the sound of your violin. If you want to use four fine tuners for easy tuning but also want to keep the original sound of your violin, consider using a plastic tailpiece with integrated fine tuners instead of a wooden one. Always loosen the tension of the bow hair after each practice or playing session. Why? Because the violin bow can lose some of its camber if you do not. It means that if you do not loosen your bow regularly after playing, the tension causes the stick to warp over time, losing its slightly convex or arched shape. Have you noticed that the hair of your bow is dirty near the frog? This is the dirt from your fingers. To keep the bow hair clean, avoid touching the hair with your hands. Also, the natural oils that your skin secretes counteract the gripping effect of the rosin. When you are adjusting your violin’s tune with your pegs, always support the neck part of your violin with your other hand. This is done to decrease the risk of snapping your violin’s neck. Re-hairing depends on how much you play your violin, most people who play 2-4 hours a day at least get their bow re-haired 2x every year. If you are losing a lot of bow hair, you should consider getting your violin bow re-haired, so that you can prevent the bow to warp. 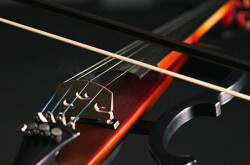 Changing violin strings too often can be quite expensive and may not even be necessary. However, not replacing them when they need to can result in several drawbacks and can be very serious. 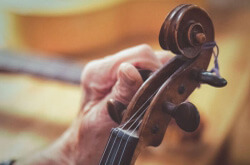 Experts advise changing violin strings whenever they look frayed because if they are, there is a higher chance that they might break while on practice or during a recital. To change strings, do it one at a time to maintain the tension over the bridge. If you remove all the strings at the same time, the bridge and the sound post may fall over. Your fingers have oils coming from the glands that can react and strip the varnish off of your violin. Knowing this, you should avoid touching the violin with sweaty hands or only pick it up by the neck and chinrest. Never use glue that you can purchase somewhere to your violin. Violins are crafted using a unique, weak animal hide glue. This glue allows the violin to breathe properly during different weather conditions. Go to a luthier if you think that your violin has parts that need gluing or repair. Always check to see if the sound post of your violin is in the correct position or if it has fallen down. If it has fallen down, take your violin to a luthier, and he or she will reset the post and place it in the correct position. 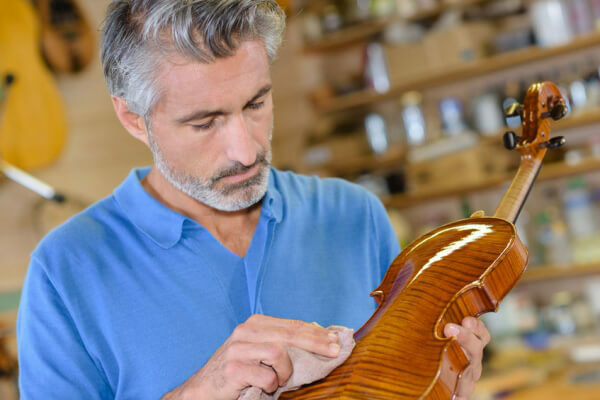 Just like you bring yourself or anyone from your family to the doctor for a regular check-up, your violin should be brought to a violin maker or luthier to keep it in shape and for it to be cleaned and maintained. They are the ones who know how to take care of a violin properly. You can ask them questions, and you can ask them about ways on taking care of a violin. Also, there are many specific violin making/repairing tools that you cannot find by yourself. So, as a general rule, if you are not sure of something with your violin, consult a violin expert like luthiers to avoid making mistakes and to prevent damaging your violin and bow. Don’t ever ignore minor problems in the violin because it can become a significant, complicated issue. Keeping your violin in good condition can help maintain its tone, stability, and its market value. 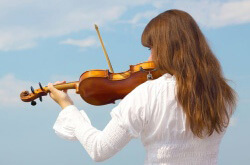 As a violinist, your responsibility is not limited to practicing, doing rehearsals, and performing in front of the crowd. But in cleaning and taking good care of the violin as well.